Lightly drain tuna; do not press out all excess liquid. Combine tuna, parsley, Vegenaise, red onion and olives. Stir with a fork to break up the tuna, then add beans and gently combine. Toss arugula with olive oil and lemon juice. Spread hummus on toasted bread. 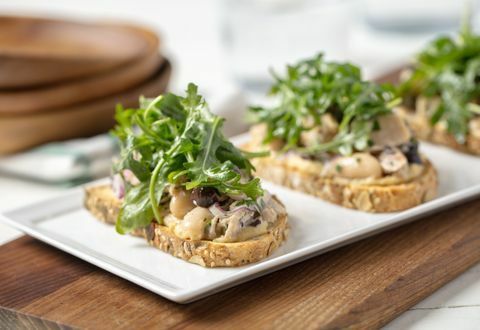 Top each piece of toast with 3 tablespoons of the tuna mixture and ¼ cup of the arugula mixture. Sprinkle with cracked pepper to serve.